When working on the Job card terminal or Job card device you are able to access attachments to the orders you’re working on. This is done by clicking the attachment button/menu item. Job card terminal attachments button. 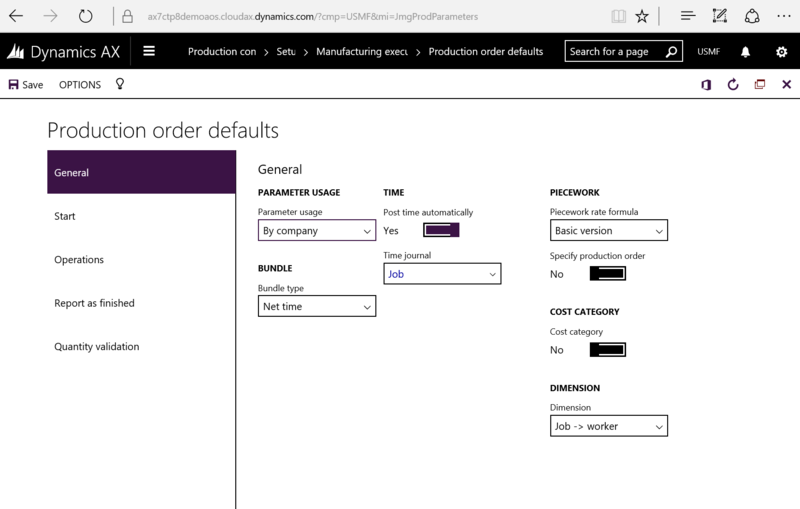 This is done by configuring the Document Groups (Production Control > Setup > Document Groups). 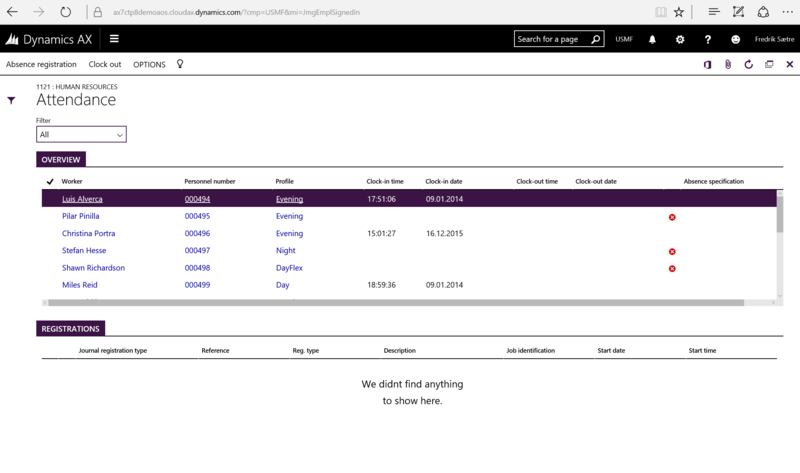 Simply add a new record, select the document types and add the users who will view the different documents. You might want to create different Document groups for different individuals if they are supposed to read different instructions or documents. 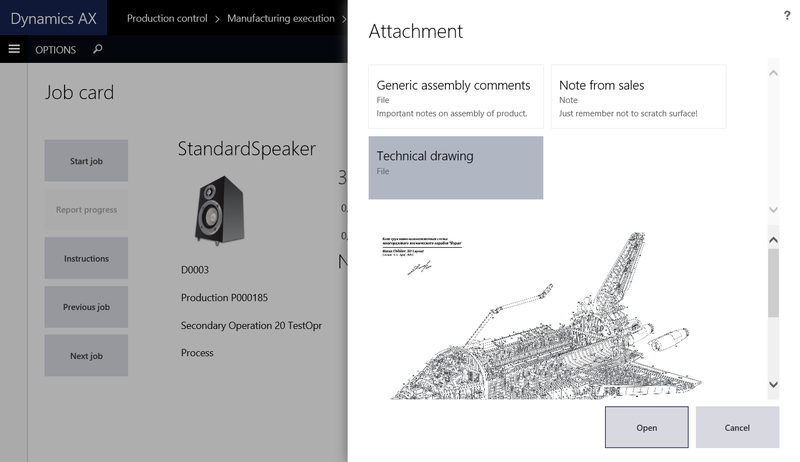 Selecting “Reading required” in the document types section will prompt the user with a dialogue when starting the production. The system will now look on the production order as well as on the item to aggregate the attachments! 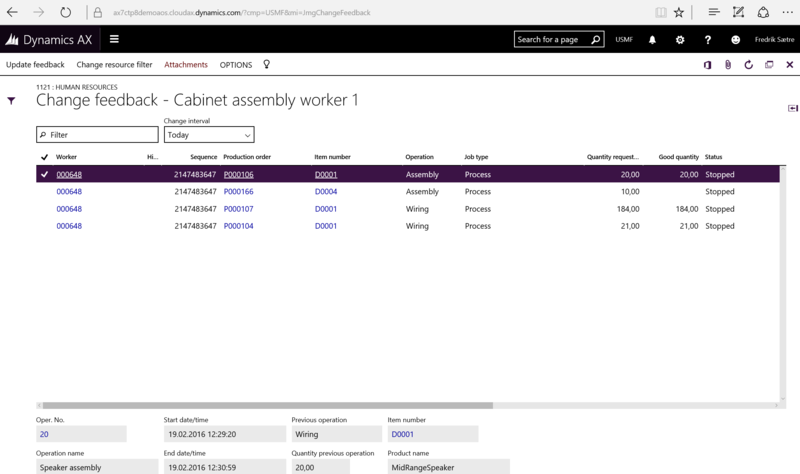 Attachment lookup with preview! Looks nice! In a dynamic factory setting where human resources go back and forth between different jobs, roles and machines it is important to track each resource to get a good overview of the costing. Some times people go around helping each other on tasks and also work as a team throughout the entire day or for a longer period of time. When many workers work together on multiple production orders within a period, you can task one of the persons to be responsible to register time for all users. This is done by creating a “team”. In a team you have the pilot and the team members. The pilot is responsible for the terminal registrations for all the team members. This is done by simply changing jobs as usual. The team members use the “assistance” functionality to join a team. Simply click Assistant and select another signed in worker to start a team. Teams can not be “nested”, meaning that a team can not be a part of another team. Not because of the functionality. The tree view is clearly there to illustrate a multi level hierarchy. There just isn’t any way for a team pilot to assist another team pilot. You would have to hack it to do so, and then I don’t know what happens to cost calculations. The team pilot, Bill Malone in the example above, will change jobs and the cost of the team members (Dana and Christina) will be assigned to the jobs that the pilot is working on. Before the pilot checks out for the day, and still is pilot, he will get a message saying he has to change pilot before checking out. The pilot then uses the “Assistant” function as well, but since he/she is a pilot, the menu will say: Change pilot. After selecting one of the team members to be pilot, the user will be demoted to team member. A dialogue shows to confirm this. If you try to work with assistance and you get a message about missing jobs, it is because your system is not ready. Remember to check the “registration” to be able to use it in time and attendance. A smart way to use this feature is if you have a resource that handles many jobs at once and do a shift change. I have a customer that has a production line where many (40-100) jobs can be active at once from about 1000 released jobs. Instead of the shift coming on has to register to all the jobs and select them from the enormous list of jobs, he/she uses this feature for a hand-off. The shift coming on signs in and registers as assistant on the one working on all the jobs. The shift going home registers the person coming on as pilot and checks out. The jobs are then handed over. A great time saver. To activate this feature for the terminal user. 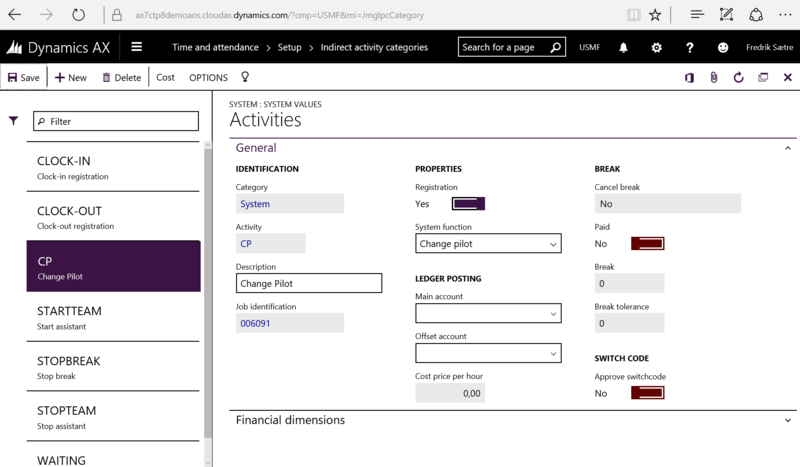 Go to Human Resources > Workers > Workers | Employment > Time Registration > Supervisor Option and set it to “Yes”. Payroll employees are continuously hammered with questions like: How many vacation days do I have left? What is my flex account balance? How many overtime hours do I have so far this period? What is the balance of “this” account? These data are often presented to the worker on the payroll report or payment slip and at that time often spark a debate with a bunch of employees all at once. Putting continuously updated account balance information in to the hands of the worker is pretty important as it frees up a lot of time for the payroll employees. Some, but not all, of this info is presented as default in the time and attendance (Paytime, Overtime, Absence and flex). However, you may want to present the worker with other account balances, like vacation for instance. The way you do this is by grouping together different payroll types in to “Payroll statistical groups”. The Payroll Statistical Group also has other usages like weighing average balances within a period and I’ll go in to that in a later post, but today we’re just looking at showing balances to end users. It is a set of accounts that you group together to show a balance, and you can choose if it should show only for the current period (Paytime, Overtime, Bonus that are paid regularly) or the total account balance (Flex and Vacation). The groups are then presented to the worker in a list that you can access in the time and attendance registration form called “Balance”. To set this up you must first set up the entity that group your accounts for a summed balance. Go to Human Resources > Setup > Time and attendance > Payroll > Payroll Statistics. Create the summary groups for your accounts. “Transfer” means that the account balance for previous periods are accumulated in the view. Go to “Setup” and add your accounts. That is it! Now you can present any kind of account balances to an employee and ease off many questions to the HR/payroll department. 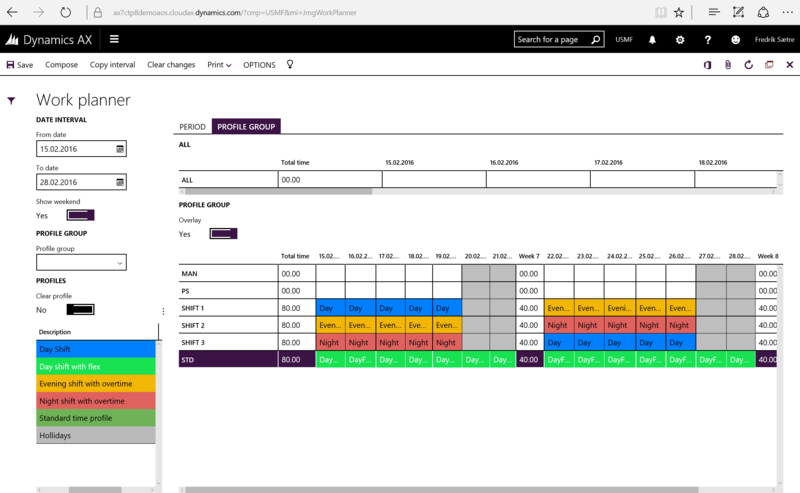 We have noe looked at how to manually do shift planning by using the Work planner interface to work with the profile calendar table. If you want to automate the shift process, you can do so as well. The profile group can be associated with a setup that automatically assign a profile based on the clock in time. and click the Profile relation menu item. Add your profile and the time intervals that the clock in time should trigger at. You can also create regular shift variations. Like for instance in high demand season (01.03..31.08) we run three shift, but in low season we run only two. Example of a season variable profile relation setup. Work planner is an excellent tools to handle your workers profiles over time and work efficiently with the profile calendar. It basically is a visual representation and painting tool (Yes…) of your profile calendar and the reason why you want to have some logical coloring of your profile settings. This solution was in CTP8, but was deprecated in the RTW! However it is still in there in the code. It is just the menu item that is not included. 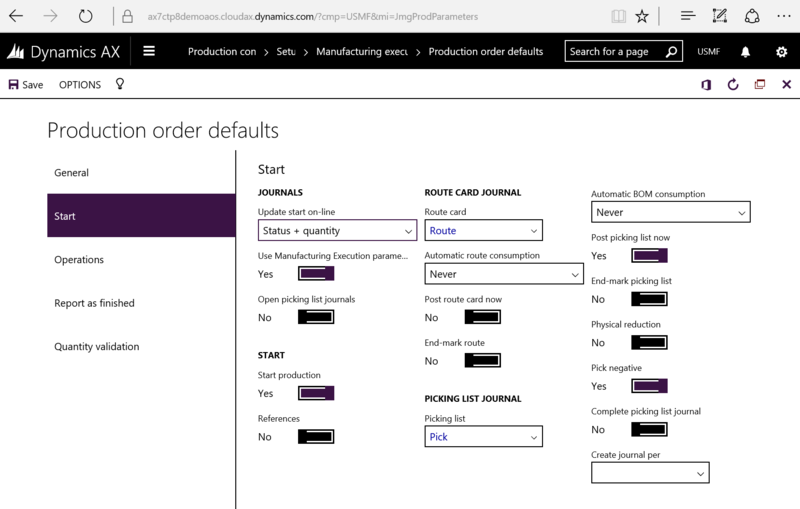 Find the JmgWorkPlanner form and add create a menu item so you can call it from the browser. My customers use it to do shift planning and make those off-weekly-work-profiles work (like someone having half day two days a week, but not the same days next week and free every third Friday after a full moon and such). To set this up you need to add a color to you profile. Check out my earlier post on time profile configuration for more info. You find the Work planner at Time & Attendance > Work planner. 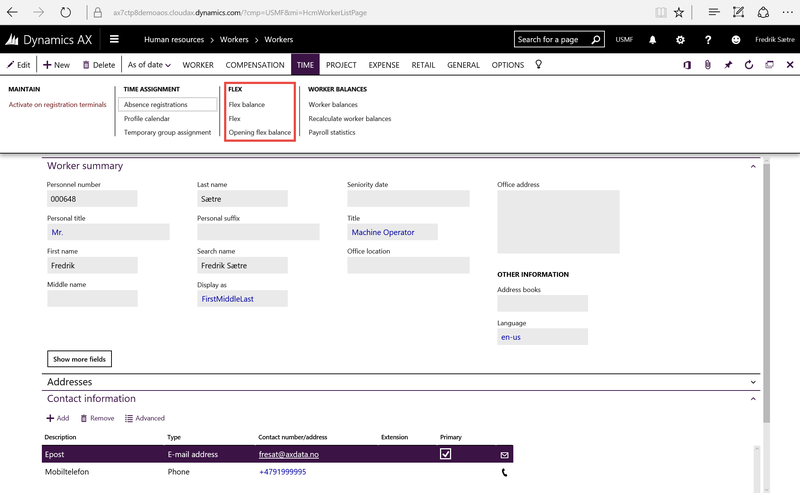 When the form opens it gathers all the data from the profile calendar and creates an overview in the form. “Profile Group” has a section for all and a section with rows per profile group. You can filter based on calculation group and/or approval group. The Display options are layered and shows the profiles in the way the profile calendar is queried from the Time Journal creation. You can activate them at will by clicking the check boxes. “Overlay” will show the profile group and all, Standard profile is the default profile on the workers employee settings and then you have “planned absence”. The absence can be shown and you can pick the color it shows in the grid. Here you can pick the date interval for the form and clicking “show weekends” gives a grey color on Saturdays and Sundays. The Profiles are listed and shows in the color as set on the profile. You can filter down the profiles by using the profile group. These will then show only the profiles in the profiles relations for this group. Select one of the profiles in the list by clicking it and then draw these profiles on the dates for each user or group/all based on the pane you’re on. Check the clear profile and draw if you want to delete/remove. After you’ve finished you’re work planning. Click “Save” in the top menu and the profile calendar is updated with the new data. The profile calendar is used to make planned changes to the default profile that is used for calculation. When doing the profile calculation the system checks the Profile calendar to override the default profile and this is loaded as the profile for that journal. So you can predetermine the profile that the user is going to have at calculation by creating a record in the profile calendar table. 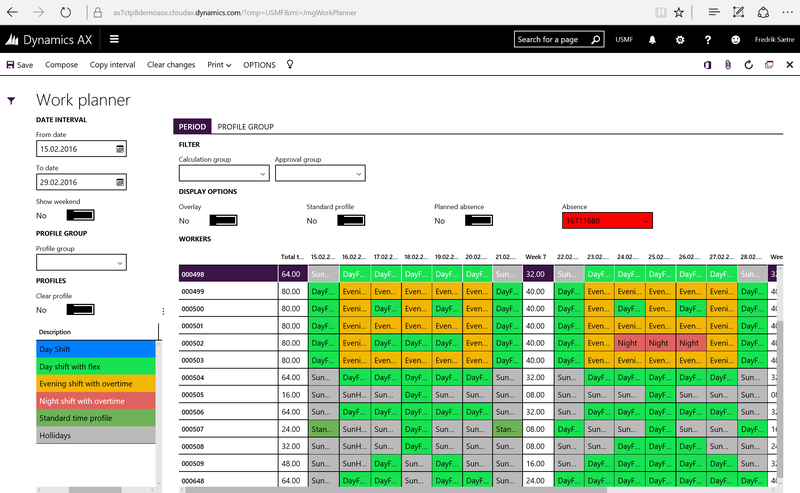 You can set this up for special work days that deviate from the standard work hours, but it is also a very nice tool to handle complex profiles where the profile changes from week to week. Go to Time and Attendance > Time Profiles > Profile Calendar to add new records. You can do changes for entire profile groups or for all workers as well by changing the Profile calendar code column to Group or All. 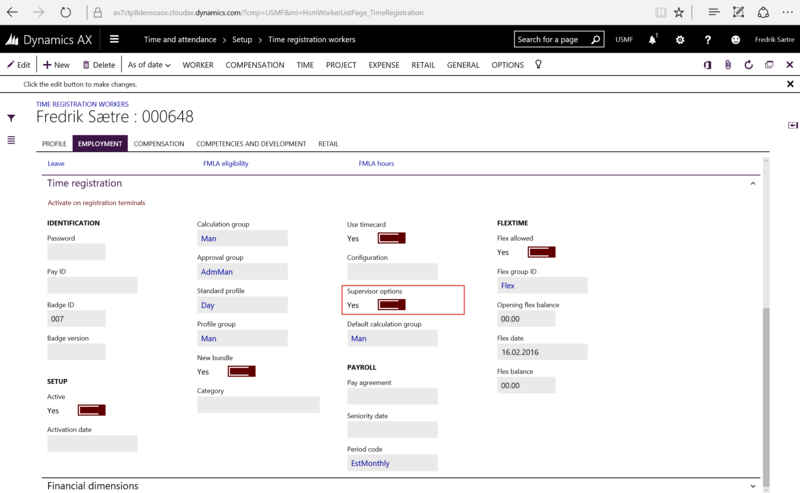 Use special day column to trigger the special day in the pay agreement. For instance if a Monday is Christmas Day and if someone comes in and does work, they will get the special day Pay agreement instead of a Monday. Since one record is only referred to one day it takes a while to input a whole week manually. You can easily create this by using the Compose function. You can also copy an interval for instance if one week is day-shift and one week is night-shift, then this fortnight can be multiplied as many times as you want. You do this by using the Copy interval function. There is a great graphical tool for handling profile calendar which is called job planner. I will look into that next. Flex: Recalculate the workers flex balance. 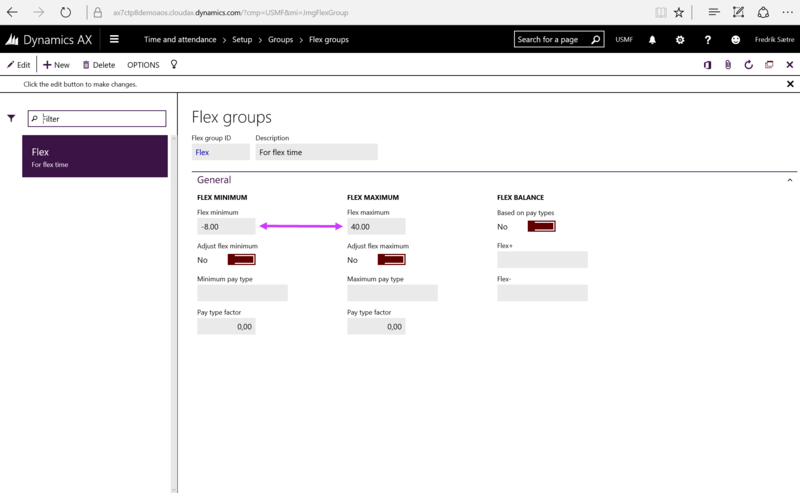 Opening flex balance: You can set the Opening Flex balance of a worker if the worker already had some time built up at implementation or as a transfer from another company. 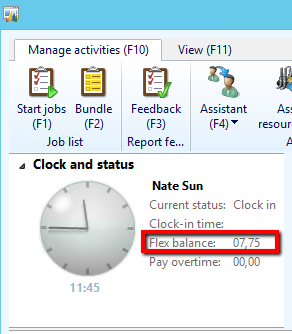 Flex balance: Shows an overview of the workers flex account balance chronologically through time. 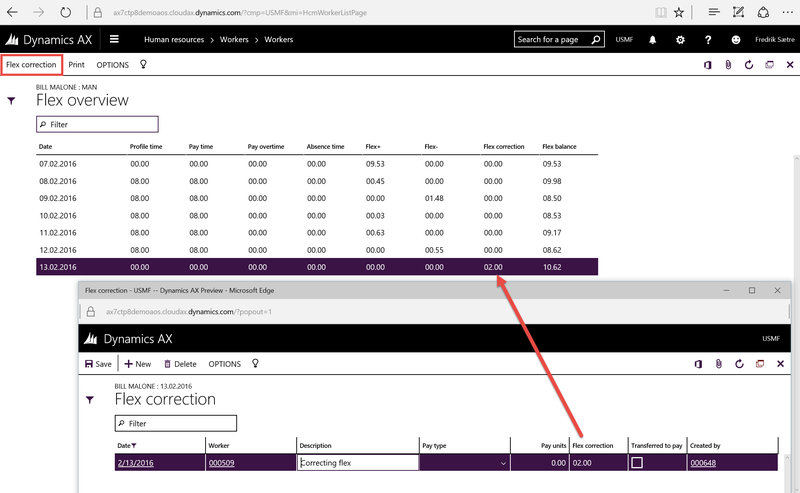 A new record is put in to this table each time the user has a flex transaction at calculation and the flex balance is recalculated. You can also post payroll transactions in the same correction. A good example is that you can replace overtime with flex time. This flex correction can also be performed by the system. The balance for a worker can exceed the limits of the Flex group settings. Some just want to report on the issue and make sure that the users get back within the limits them selves or you can run the flex correction job to reduce or increase the balance for the user like the manual example above. Based on the flex group settings you can replace these with pay types for each flex time unit adjusted. This is configured in the flex group. The periodic job is found at Time and Attendance > Manage flex time > Adjust flex balance. 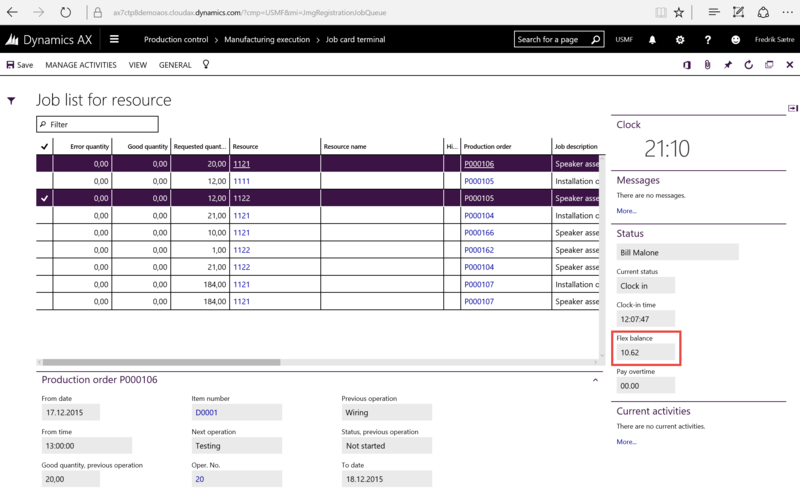 The system looks at the Correction date and adjusts the Flex balance to the Max or Min flex time allowed in the flex profile the worker is associated with. The worker can check their flex account balance in the Job card terminal in the Status fact box.